Um, how sweet is Taylor Swift? 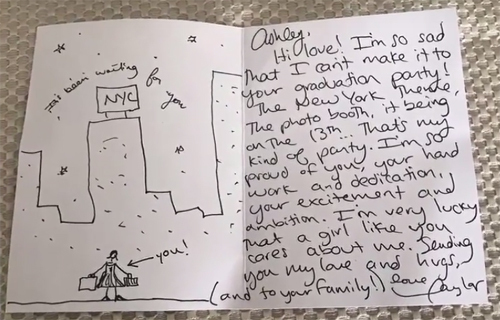 The singer went out of her way to send flowers and a handwritten note to a girl named Ashley, who invited Taylor to her college graduation party. Talk about flattering! Thanks to T-Swift’s absence, this girl was able to gain a considerable amount of attention from the note and the flowers, which arguably might be even more memorable than T-Swift actually going to the event. But can you imagine if she did show up, in that dress! Love it! Even though Taylor has been out of the spotlight for a while, even when she doesn’t show up she can still surface in a big way. Need more celeb info? Check out CelebsGo.com!